Ol Pejeta - Conservationists and scientists have held talks in Kenya this week to come up with a last ditch plan to save the northern white rhinoceros from extinction. There are only five northern whites left on the planet: three live in a 283ha enclosure on the Ol Pejeta Conservancy in central Kenya, where the emergency meeting was held on Tuesday, while the other two are kept in zoos in the Czech Republic and the US. "The battle is to work out what is feasible scientifically in the short time still available to us," Richard Vigne, Ol Pejeta's chief executive, told AFP. Northern white rhinos have suffered from the loss of their traditional rangelands in Central African Republic, Chad, northeastern Democratic Republic of Congo and South Sudan, nations that have been hit by decades of chronic conflict, lawlessness and misrule that made conservation impossible. Poachers have also taken their toll, killing the animals for their horn -- long prized for making ceremonial dagger handles in Yemen and, more recently, to be ground into a powder for medicine in Asia. Rhino horn is worth more than $65 000 per kilo on the black market, more than gold or wholesale cocaine. The remaining northern white rhinos are all elderly or incapable of natural reproduction, so artificial methods are now the only hope. The best chance is the creation of a "test tube rhino" by in-vitro fertilisation. 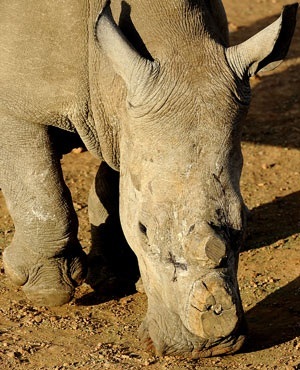 The embryo could then be implanted in the womb of a surrogate southern white rhino, a closely related rhinoceros subspecies that is less endangered. Past attempts at artificial insemination of northern white rhinos, carried out at the Dvur Kralove Zoo, failed, and surrogacy is untested. Stores of frozen sperm and eggs could be used to revive the animal artificially, but neither method will provide an immediate solution meaning the northern white rhino will likely disappear, at least for a while. "The science is just not there yet," Vigne said.